against religious ideology in Xinjiang. A large number of Uyghur Muslims are in detention centres without trial and some in re-education camps as part of China’s crackdown against religious ideology in Xinjiang. The Chinese internet is heavily monitored and regulated by the government; therefore, these discriminative and anti-Islamic articles that give rise to Islamophobia among Han Chinese only exist due to state’s tacit support. The government has announced regulations—like “Xinjiang Uyghur Autonomous Region regulation on de-extremification” as well as the recent “Religious Affairs Regulations”—to insult the Muslim Uyghurs by monitoring their religious activities and then measuring those to see if these practices or activities could be deemed fit to practice by the Chinese government. So, in essence, anything religious—no matter how mundane—declared ‘impermissible’ by the government will not be allowed. Such policies are only helping create an atmosphere of fear, fuelling tensions between Han Chinese and Uyghur Muslims. “The school expelled me because I prayed secretly before my first year’s final exam. A few classmates in my dormitory found out about it; they reported to the school that I am a ‘witch’, ‘extremist’, and ‘potential terrorist’. Afterwards, all other Chinese classmates refused to stay with me in the same dormitory. They said they were scared of me. I was [not only] expelled from the school, [but also] detained and questioned for a few weeks at the Kashgar police station upon returning home. So, I [had to] leave the country,” said Adele, currently studying in Canada, who studied Chinese history at Chengdu University in 2013. It is quite evident that Chinese government and Chinese state media are playing a direct role in fuelling Islamophobia, all the while creating friction between Uyghur Muslims and Han Chinese due to its anti-Islamic policies. 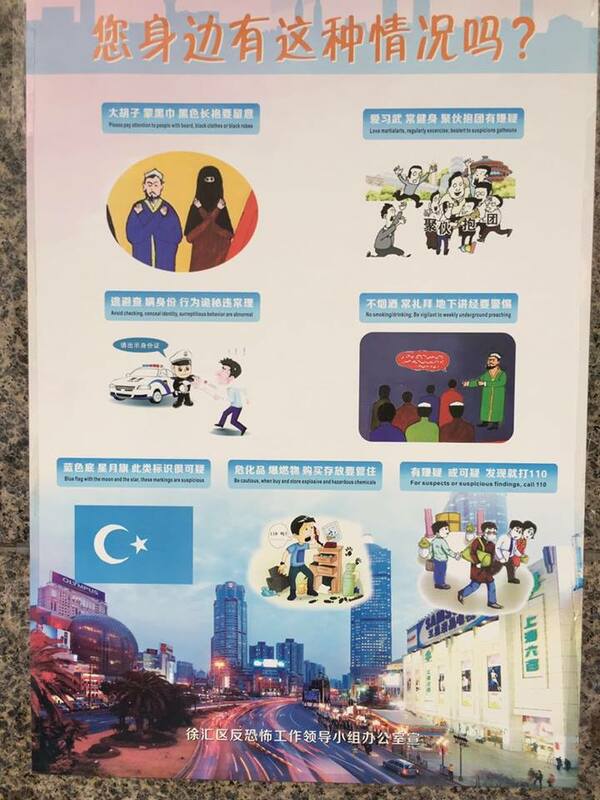 On one hand the state is allowing Islamophobia to rise; on the other hand, the Chinese government has tried to reduce friction between Han Chinese and Uyghurs through artificial means. Part of China’s so-called “ethnic friendship and stability campaign” forces two hostile nations—the Uyghur Muslims and Han Chinese settlers—in Xinjiang (also known as East Turkistan) to love each other. It was formally introduced by Communist Party Secretary of the Xinjiang Uyghur Autonomous Region Chen Quanguo. As per the policy, every Uyghur family is assigned a Chinese family and they are encouraged to behave like family relatives—visit each other and dine at each other’s homes and even sleep at each other’s residence. It goes without saying that a good relationship is based on equality, trust, and mutual respect; in the case of blood relationship: unconditional love. However, ignoring this fact and creating an artificial family relationship between two hostile nations through force and coercion will only increase distrust and paranoia. Many Uyghurs view these Chinese “relatives” as government spies. “At school, I was given a Chinese sister. She is very nice. But I don’t want to be reported as an extremist to the government, so I have to be very careful. We must follow government policy,” said Gul, a high school student from Aksu. Many Uyghurs do not believe the policy is a success. They know the relationship between them and Han Chinese is different as compared to the relationship between minorities and majorities in other multi-ethnic countries. China has asserted its territorial claims through a blatant distortion of Uyghur history, harsh repression and assimilation, and migration of millions of Han Chinese into East Turkistan—in an apparent attempt to change the demographics. “The fake ‘relationship’ forced upon the Uyghurs and Han Chinese is a rather crystal clear relationship between that of invaders and a nation that has been invaded. Unlike Han Chinese, Uyghurs do not have any fundamental rights that citizens of nation-states enjoy elsewhere in the world,” said Dolkun Eysa, the general secretary of the World Uyghur Congress. It is crucial to note that Chinese government has slowly attempted to paper over this friction by banning hateful phrases against Islam and Muslims that used to widely spread on China’s Weibo microblog. “Banning hateful words here or there is not enough; it is not the honest solution since the root cause is not addressed,” Eysa added. Since 1949, both groups have witnessed many conflicts. Every ten years or so, Uyghur uprisings have erupted against occupation and injustices, including conflicts between Uyghur farmers and Han settlers over issues such as water and land control. Instead of ending its draconian policies and harsh regulations towards Uyghurs and putting an end to the anti-Islamic narrative in the state media, the Chinese government has obsessed over artificial attempts at harmonising the society. Therefore, similar to fake made in China products, these policies also belong in a dustbin. Rukiye Turdush is an independent human rights activist and writer based in Toronto. She is a keen observer of Uyghur affairs both inside and outside China.